The Tour De Yorkshire makes a triumphal return to God’s Own County this weekend, providing a thrilling backdrop to a host of World Tour and Pro Continental teams looking to make their mark on the race. Team Sky‘s Lars Petter Nordhaug retruns to defend his 2015 title with the backing of a strong supporting cast of Team Sky riders, but will have to contend with an on-form Steve Cummings and Adam Yates, whose Orica GreenEDGE team have imposed themselves throughout 2016 thus far. 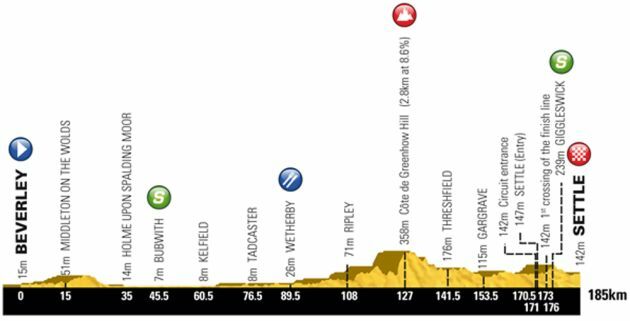 The first King of the Mountain points of the weekend are on offer at Greenhow Hill, appearing at 127 km to offer a 2.8 km test for weary legs that have been gradually inching uphill since the feed stop at Wetherby 30 km prior. Here Simon Warren gives us his guide to what’s on offer, and how us mere mortals might tackle the climb. On this hill the pain comes in bursts over four distinct stretches of tough climbing, with brief respites in between. Attack each hard section, get your breath back, spin the legs, and then attack the next. The climb starts on the ?at through Pateley Bridge. Heading west, the road rears up viciously past The Royal Oak pub and out of town. Rising at 18%, this opening stretch is the shortest of the hard sections. The road then plateaus slightly before hitting the second at 16%. Drag yourself through the woods to reach the third and longest section of hard climbing. Ever so slightly easier at 15%, it alleviates when you pass some farm buildings, but it still keeps coming at you. The fourth and final ramp delivers you to the top of the moor. As the gradient relaxes, you can see the rest of the climb before you, bending over the brow and rounding to the left where you finish just past the quarry at the sign for Greenhow village. Come back over the next few days for more on the best climbs from the Tour de Yorkshire. And if you’re watching live, keep an eye out for Simon and his famed 100 Climbs sign. Cycling Climbs of Yorkshire by Simon Warren is the essential jersey pocket-sized guide to the county’s finest climbs, and is released on the 8th May. In the meantime, keep up to date with Simon on Twitter @100Climbs.